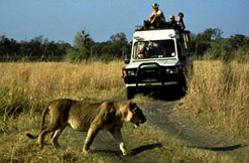 Crocodile Camp is a 12 km drive from the small town of Maun towards the Moremi Game Reserve in Botswana. Situated on the banks of the Thamalakane River, Croc Camp hosts an abundance of bird life with the occasional hippo or crocodile visitor, all of which can be viewed while enjoying spectacular sunsets from the bar deck. The camp grounds are beautifully maintained with a private swimming pool for residents and well renowned restaurant for scrumptious meals. The accommodation offering serves a two tiered requirement: well-equipped STANDARD CHALETS for a comfortable stay and our new DELUXE CHALETS, for a more luxurious experience. 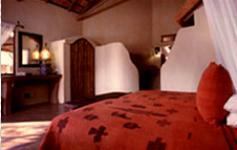 All chalets are en-suite, with wooden verandas, ceiling fans, mosquito nets and housekeeping. FUNCTIONS AND CONFERENCES: Take advantage of our magnificent setting and established infrastructure for all exclusive functions and conferences. Benefit from attentive staff, an excellent kitchen and full bar service when entertaining, celebrating or brainstorming. Kindly contact us for packages tailor-made to your requirements. 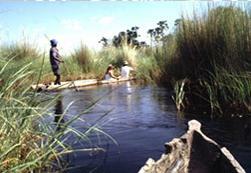 Mokoro Trips: Become part of the bustling river life by easing between the papyrus clad banks on traditional ‘mokoro' canoes. These are propelled from the stern by skilled poler guides, allowing the guests to sit back and absorb the scenery. For full day trips, Crocodile Camp prepares delicious picnic lunches which can be enjoyed on the banks of the river after a bush walk and refreshing swim in the natural delta pools. Scenic Flights: Two 6-seater aeroplanes are on stand-by, giving guests the opportunity to see the delta tapestry, complete with herds of wildlife and mesh of meandering waterways, from a bird's eye-view. For the especially adventurous, learn how to fly in a day and spend 45 minutes in the left hand seat over the delta! Overnight Moremi and Delta excursions: To get a taste of the swamplands and the budding intrigues that unfold for explorers, Crocodile Camp organises overnight or three day adventures into the delta. Night drives, motor boat cruises and camping can be arranged at relatively short notice for guests who prefer to see where their African foray leads them on a day to day basis, rather than pre-booking a fully fledged safari. Horse Riding in Maun: A great way to enjoy the abundant birdlife along the Thamalakane River flood plains, horse riding can be arranged for groups with fair to good riding experience.